Two plants close the growing season with glorious bloom: chrysanthemums and asters. Mums come in warm tones of red, pink, orange, and yellow  as well as white. Asters complement them perfectly, with cool blue-purples, lavenders, mauves, and a deep wine-red (as well as white). But asters have an advantage: they're hardier. The genus Aster is prolific. New hybrids appear every year  not only from the plant breeders, but also in the wild. The most common hardy species at retailers is the New York aster, or Michaelmas daisy (A. novi-belgii). I've collected several of these; my favorites are the ones which get closest to blue, like 'Professor Anton Kippenberg'  the first of my asters to bloom. New York asters are susceptible to mildew; it helps to avoid sprinkling them, and give them good air circulation. 'Pink Lady' is more resistant than my others, but I used to think her pale mauve color was wishy-washy. Then I learned she's no longer commercially available. I thought about how dependable she is, steadily increasing, how good it is to have a variety of colors, for contrast... and suddenly I was planning where to put next year's divisions, instead of giving them away. You can also buy New England asters, which have showier flowers: about two inches wide. But since they're native, and not endangered, it's easy to find some in a field and get permission to dig them up. I found not only the more common purple ones, but also some magenta-pink. The purple have self-seeded all over my garden  an embarrassment of riches, since they grow four to six feet tall. The pink was robust too at first, but no pink seedlings appeared, and recently the plant died (I'm not sure why). Fortunately, just after that I discovered a seedling with that great pink; I hope I can keep this plant happier! 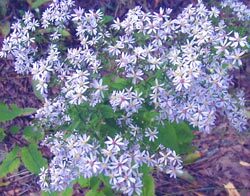 One other aster in my garden came from a weedy roadside. I don't know its name, but it's everywhere  not only in the wild, but in my garden, now, too. (I'm trying to identify it, but there are so many varieties!) I've never seen it at a garden center. Do growers think it's too common? Admittedly, the color's not showy, and it has tiny flowers  but so many, that it looks like clouds of pale blue floating all over. The photo is the mystery aster: each floret is 5/8 inch across.